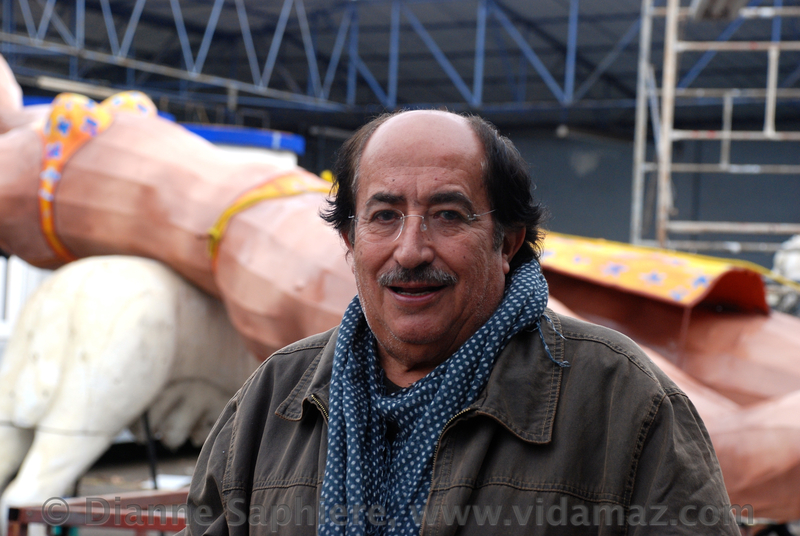 Behind the Scenes of Carnavál: The Making of a Giant Statue | ¡VidaMaz! Every pata salada loves the monigotes, those super-sized statues that go up along the malecón and in the Plazuela Machado each year in the weeks prior to Carnavál. The tradition began in 2005, with Maestro Jorge González Neri’s replicas of the work of Antonio López Sáenz, Mazatlán’s illustrious painter and sculptor. Last year, for Festival de los Imperios, we had gigantic warriors from major world civilizations protecting our fair city. And we all loved it! Excited to see them go up, rather heartbroken to see them taken down, it is a terrific tradition. Every year we wonder and guess, what will the monigotes be this year? On Saturday we were driving down Avenida del Mar and happened to see them putting up the first statue: the mime Marcel Marceau. Ah, the excitement! This year, with the theme of La Linterna Mágica, we are privileged to enjoy eight-meter tall likenesses of international film stars — Las Luminarias de Neri. Marlon Brando, my beloved comic actor Cantinflas, the pachuco Tin Tan, actor and luchador El Santo, Pedro Infante, and Al Jolson were erected over the last few days. Marlene Dietrich went up this morning at Playa Norte. Just this afternoon we watched them put Charlie Chaplin up in front of our home. Oh, the thrill! The rumbera from the Golden Age of Mexican cinema, La Tongolele (Yolanda Montez), went up late this afternoon. We watched it leave the taller after final painting and varnishing. Towards the end of the week the final monigote, of Marilyn Monroe, should make her appearance. We watched her head being carved today (see video and slideshows below), and her body being welded. Maestro Jorge González Neri himself told me that, yes, her skirt will be flying up in that iconic pose of hers. So, how do you make one of those giant statues for Carnavál de Mazatlán? Well, the Maestro is a set designer who creates pieces for the stage as well as for public events. He is based in Monterrey, so there is a lot of sending of drawings and designs back and forth, between Monterrey and CULTURA here in Mazatlán, as they agree on what the monigotes will look like each year. It sounded to me like Neri himself is a bit astounded at how large they’ve become — the bar higher every year. Once designs are agreed on, the staff of his taller begin working. Finished parts and parts in process are shipped to Mazatlán. A month or so prior to Carnavál, the Maestro travels here with a crew of 15 of his people from Monterrey. They hire papier maché people here locally, people who have now been doing this for years. And, in an incredible open-air artistic assembly line, they create magic! Below is footage of the workers loading the huge statue onto the truck for transport. Below is a clip of the crane workers installing Charlie Chaplin in front of our building. They stake the monigote to the beach, and counterbalance the stand with sandbags. As you can see, it’s a bit like making a piñata, or one of the papier maché projects we all did as children. But, not really. It’s nothing like that! What an incredible dream to make magic in this way, don’t you think? Click here for a slideshow of all the 2013 Carnavál de Mazatlán statues. Thank you, Maestro and crew, as well as CULTURA and all involved! This year’s “Luminarias” rock! Are you curious to learn more? A couple of years ago we visited Maestro Rigo Lewis in his taller, as he and his crews worked on the parade floats or carrozas for Carnavál royalty. He was born during Carnavál and the event and its magic run in his veins. Need a schedule of events? It’s posted on CULTURA’s Carnavál site. The inside scoop of what to attend and how it all works? Check that out here. Kathi, I sent you an email with a bunch of info. Have you changed your email, perhaps? I have the snowcrest one. Sorry, no, I didn’t receive it as of Thurs. AM! Email is still the snowcrest one. I’ll check the spammer catcher. Sorry to cause you work. The statues are just great & someday, hope we’ll see them! Will letcha know. Great job here–you’re a wonder!! I resent it again last night to the snowcrest address. Am guessing it’s in your spam filter. Si, era. Lo siento, amiga. You are doing a great service for your new town! My husband and I just returned from a week long vacation to Mazatlan. We saw the monigotes and noticed new ones in place as the week progressed. How great to see behind the scenes. Thanks so much for posting. Thank you for letting me know that you enjoyed the behind-the-scenes glimpses, Rebecca! So glad that they two of you were able to enjoy the unveiling of our giant statues this year!!! We hope you’ll be visiting again soon! Thank you for taking the time to let me know you enjoyed this behind-the-scenes glimpse, Rebecca! I’m so glad the two of you were able to enjoy the unveiling of this year’s giant Carnavál statues. We hope you’ll be visiting again soon. What do they do with the sculptures when the Carnaval is over? You know, Valerie, Greg and I were again discussing just this, this morning on our walk. In the past, to our knowledge, the monigotes have been trashed, with parts recycled for the following year. This year, I could see that some of these could be auctioned off. There are so many Marilyn Monroe collectors, for example. Our other idea was to donate them to a hospital in town, one that would have a tall enough central enclosed atrium (not sure if there is one). It would be such a joy to kids to see one of these every day. I don’t think they’ll last much longer out in the elements; they were not made for longevity. But they sure would be nice to keep around to make someone happy. Pingback: We All LOVE Our Monigotes! | ¡VidaMaz!